Govt Approves Free Trade LPG, Retail Outlets To Offer 5KG Cylinders! Govt Approves Free Trade LPG, Will Be Available In 5KG Cylinders At Retail Outlets! I am sure at some point in your life you have faced problem with procurement of LPG Gas cylinders. Probably 99 percent of home cooking in urban India happens using LPG gas. The problems are compounded if you relocate to a new place or city. Getting a LPG connection is not an easy task. You need to have all sorts of paper work to get it. Even procuring a non-subsidized cylinder is sometimes quite difficult. But that soon may become history. Government has approved Free Trade LPG (FTL) Scheme for selling 5 kg LPG cylinders through Company Owned Retail Outlets (COCO) of PSU Oil Marketing Companies. Currently the FTL scheme has been launched on pilot basis in Delhi, Mumbai, Chennai, Kolkata and Bangalore. FTL will be available in 5 Kg cylinders with or without the DPR (Domestic Pressure Regulator). Any person interested in getting a LPG cylinder can walk into these company retail outlets and procure the cylinder immediately. They will only need a identity proof to be furnished (Voter I-Card, Driving license, Pan Card, Aadhaar Card, Bank Pass book, Employees ID, Passport, Student ID or any other). When the buyer takes it for the first time, price of LPG gas plus cylinder will have to be paid. Subsequently, they will just need to pay the refill amount. The company retail outlets will also give customers instructions on safety and installation. Government has also come up with a scheme where buyers could opt for a insurance policy that will provide cover for loss of life and property in the event of an LPG accident occurs at the customer’s premises. Free trade of LPG has been introduced keeping in mind the needs of citizens who are always on the move and do not need a permanent LPG connections. In our view, this is a much needed step taken by the government and it is sure to help hordes of citizens across India. At the same time, we also think that free availability of LPG will also give rise to vehicles that are retrofitted with LPG cylinders. What do you think about this move by government? 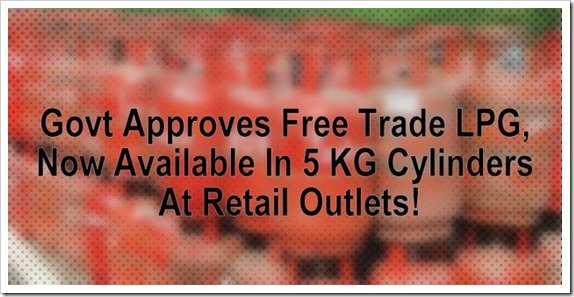 "Govt Approves Free Trade LPG, Will Be Available In 5KG Cylinders At Retail Outlets! ", 5 out of 5 based on 1 ratings. This was implemented by Indane many years back, now it is announced by the government also. Brilliant! It will be the end of delivery boys sending my cylinder to someone else or vice-versa for a hefty consideration. I think will wipe out the often-manipulated shortage of LPG cylinders and will be extremely convenient for those who have to move homes frequently.